“A sad, sweet and slightly creepy selkie tale for children. With a southern-hemisphere setting, for a change.” Margo Lanagan, author of Sea Hearts/The Brides of Rollrock Island. “The descriptions of seals, kelp and ocean, and the wild landscape of Owhiro Bay, are evocative and beautifully realised. The story starts quietly but builds to a frightening climax as the consequences of young Jake’s theft become clear. He realises that he needs to act fast to save his father’s life, and nearly loses his own in the process. This is a satisfying story of strange enchantment in a familiar, everyday setting.” Judges report, NZ Post Children’s Book Awards. “I became entranced by this book and its characters. And it happened so subtly that I didn’t even notice… there is no maybe about it. This book works and it’s a gripping page-turning tale.” Booksellers NZ, May 2013. “Rachael King… works magic in Red Rocks, her first novel for younger readers… A gentler exploration of the [selkie] myth than Margo Lanagan’s Sea Hearts, this is equally convincing.” Ann Packer, The Listener, August 2012. “It’s the school holidays; usually, Jake lives with his mum and stepfather in Auckland. With dad, he enjoys relative freedom. He explores the coast and finds the selkie’s hidden skin. A cracking yarn follows. It’s not just a great story, with unexpected twists. It’s also a lovely evocation of that stretch of Wellington coast.” Phillip Matthews, Your Weekend, June 2012. Read the full article. “A must read for readers who love animals, a bit of magic, and stories about family. Rachael King is the author of two adult novels and won the Montana Book Awards for the Best First Novel in 2007. This is her first children’s book and I hope she writes many more!” Adele Broadbent, author of Just Jack, June 2012. 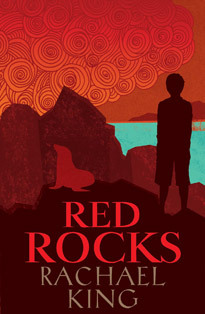 “Red Rocks is a magical adventure story, set in New Zealand, that children and adults alike will love. Rachael King has taken the Celtic myth of the selkies and transplanted it into a New Zealand setting that kiwi kids will relate to… There is a hint of darkness running throughout the story and you get a feeling of foreboding right from the start… One thing that I particularly love about Red Rocks is Rachael King’s beautiful writing. She’s very descriptive so she paints a vivid picture of the wild, windy coast. It’s the sort of book that you want to read snuggled up in bed because you almost feel the biting wind and the freezing ocean. 5 out of 5 stars.” Zac Harding, My Best Friends Are Books, June 2012. Read the full review. “An exciting tale… that will keep young readers on their toes.” Bob Docherty, Bob’s Book Blog, June 2012. Read the full review. “The language is rich, warm and slightly mysterious, like the cover, and the seals themselves are beautifully described as they gambol in the waves and kelp, or dive into the water like a “silky missile”… This is a story of enchantment, but also of a boy finding the inner strength to solve problems, fight bullies, protect his family and conquer his fear.” Phillipa Werry, Beatties Book Blog, June 2102. Read the full review.